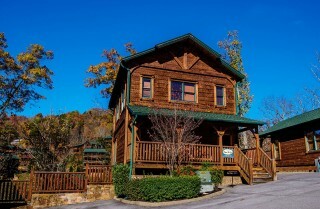 With fantastic views of the Great Smoky Mountains, a charming community setting, and a convenient location less than 5 miles from downtown Gatlinburg, the pet-friendly Mountain Getaway and a Theater offers the best of both worlds – wooded surroundings and a short drive to the area attractions, shops, and restaurants. 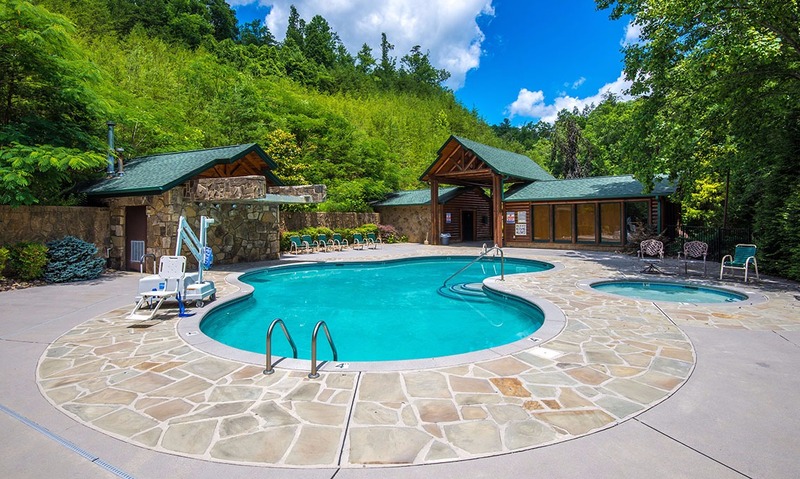 You'll have access to community amenities in the Gatlinburg Falls Hidden Valley Resort, and you'll find even more perks in the cabin. It's outfitted with king-size beds, a theater room, a big screen TV, a DVD player, game tables, high-speed Wi-Fi, an outdoor hot tub with a TV, a charcoal grill, and more! 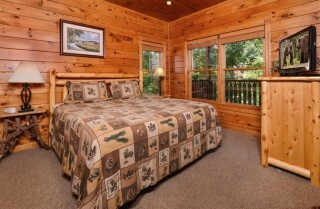 With three bedrooms and four bathrooms, it offers room for up to 12 guests. 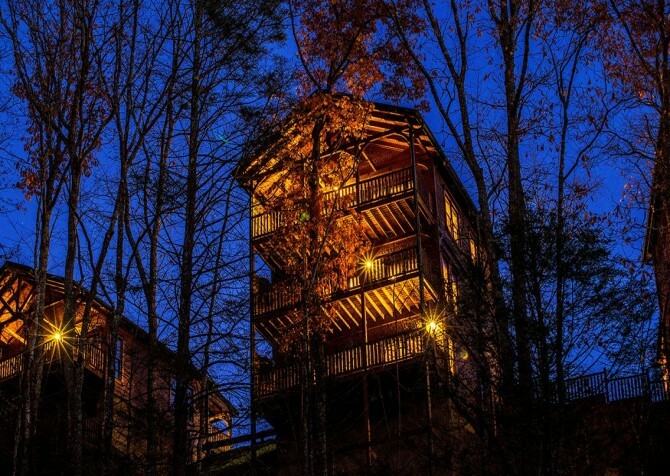 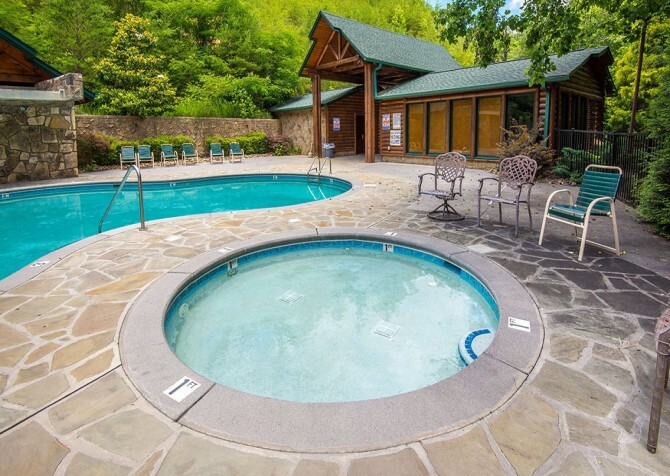 Get away with family or friends to this fun retreat in the beautiful Smoky Mountains! 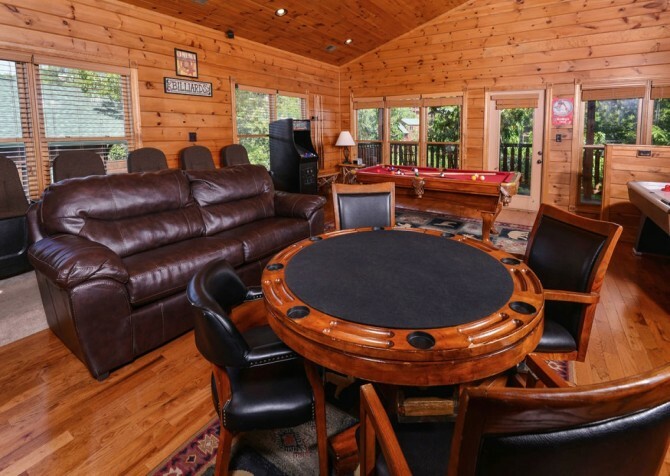 Feel at home in the inviting living room of Mountain Getaway and a Theater, furnished with comfy leather sofas and a coffee table that's large enough to play card games or board games. Year-round, it will be a welcoming place to relax after a long day checking out downtown. 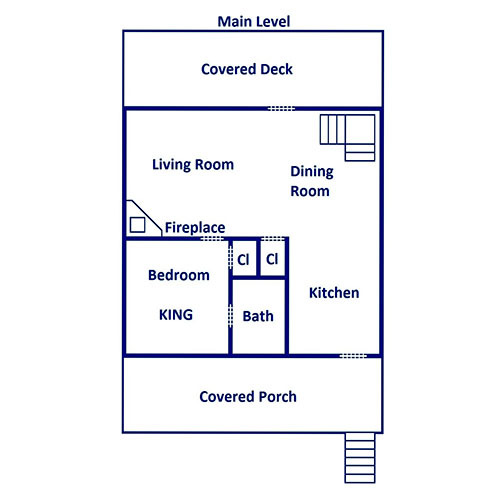 In summer, flip on the ceiling fan and stay cool while watching movies or your favorite shows on TV. 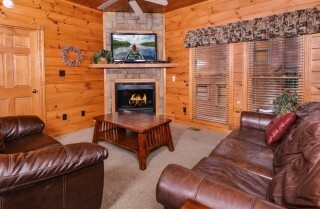 In fall and winter, stay warm by the fire while watching a ball game or having a game night with the kids. When the cabin's full and you need some peace and quiet from the fun in the home theater/rec room, this living room will be a welcome retreat. Curl up with a good book and just enjoy the peacefulness of the mountains. 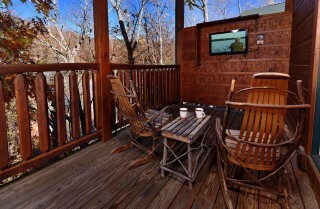 Then step right outside onto the deck for some fresh air and a relaxing view. Mountain Getaway and a Theater features many amenities you won't find in a hotel room, including a fully equipped kitchen! 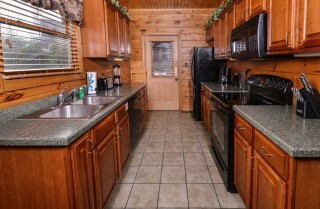 In the comfort of your own cabin you'll find a beautiful kitchen with black appliances and wood cabinets. 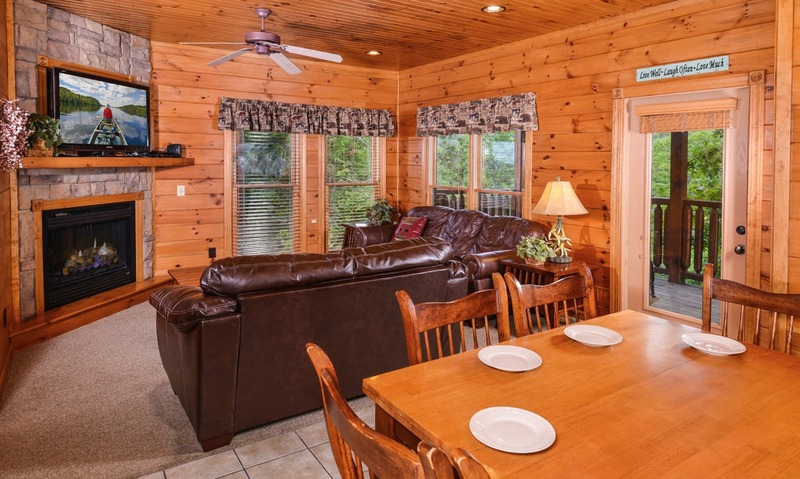 It's loaded with a coffeemaker, refrigerator, oven/stove, dishwasher, blender, toaster, microwave, knife set, and all the dishes, glasses, and utensils you'll need to enjoy homemade meals, leftovers, or snacks in the cabin. When you get a craving for a midnight snack, you can just grab something out of the refrigerator instead of driving into town. 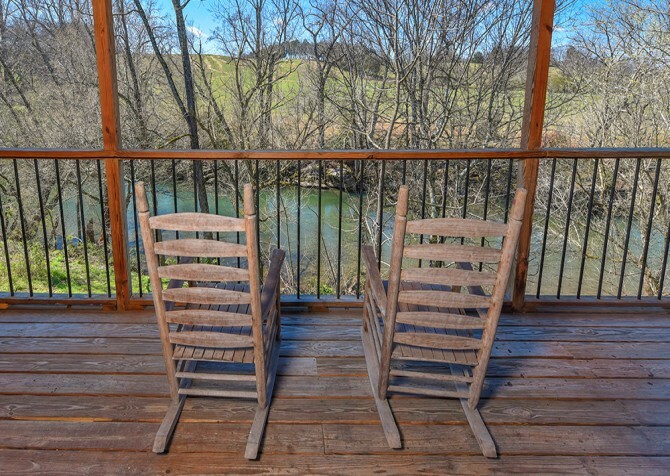 If you love to cook, just imagine making a scrumptious country breakfast, a hearty dinner for the group, or a holiday meal to remember. The kitchen also has plenty of counter space to prep for meals or for setting out a buffet of snacks to enjoy while you're hanging out around the cabin, watching TV and playing games. A lovely wood dining table with seating for 8 sits in the dining area of Mountain Getaway and a Theater. 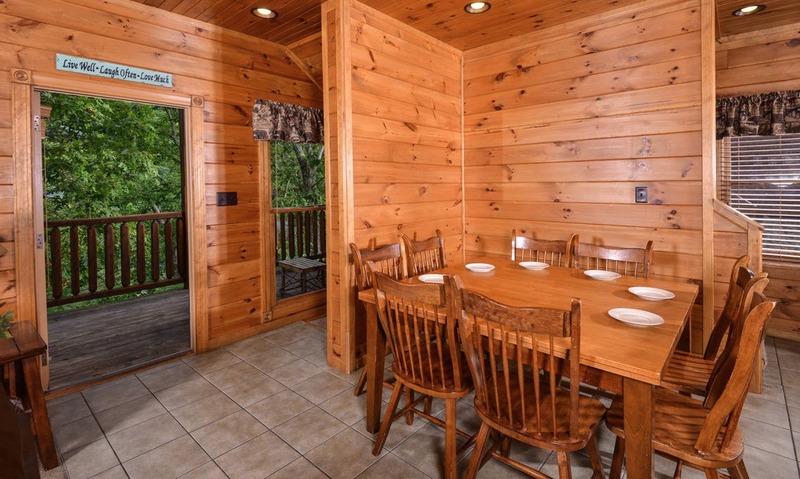 It's the perfect place to sit down for a meal with family and friends. Open to the living area, kids can have breakfast here while watching their morning cartoons, or you can catch up on the news while enjoying some coffee and treats from your purchased Mountain Breakfast basket. 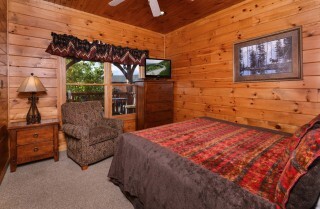 Each of the three bedrooms in Mountain Getaway and a Theater offers a comfortable king-size bed, its own TV, and space to relax. At night, each guest will have a private oasis for peace and that much-needed rest on vacation. 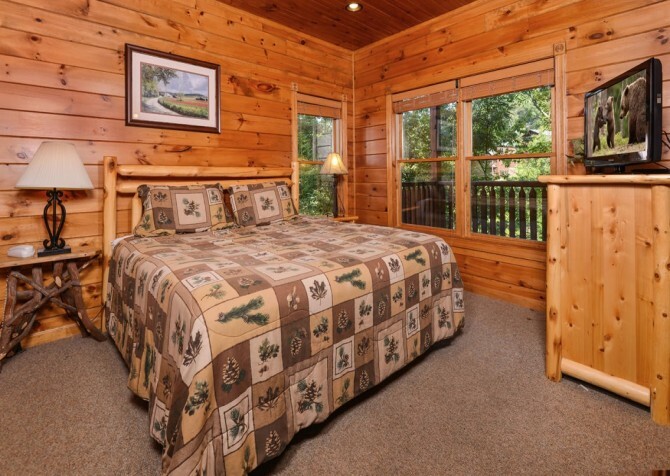 The bedrooms have a blend of log and sleek wood furniture, along with a mountain motif that adds to the classic cabin experience. 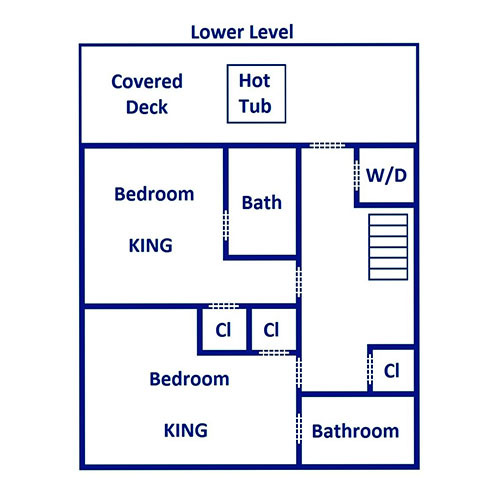 For your convenience, there are four bathrooms, making it easy for guests to get ready for going into town or heading to bed. 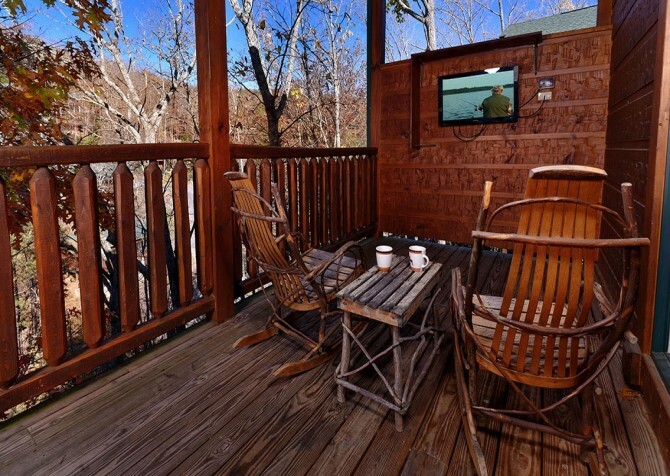 Mountain Getaway and a Theater boasts two levels of decks where guests can spend time in the great outdoors. 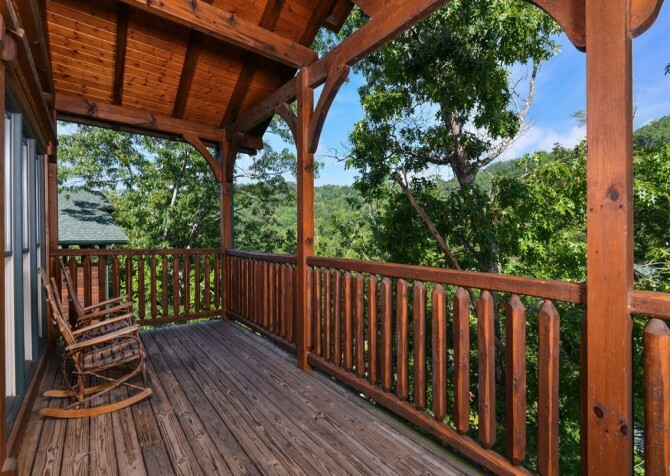 Breathe in that fresh mountain air and enjoy wooded and mountain views as you have a cup of coffee or a glass of wine in the rocking chairs on the deck. 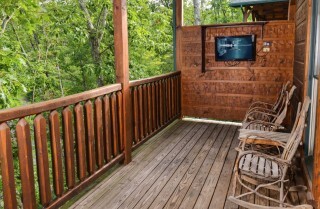 You can even watch TV while you hang out here! 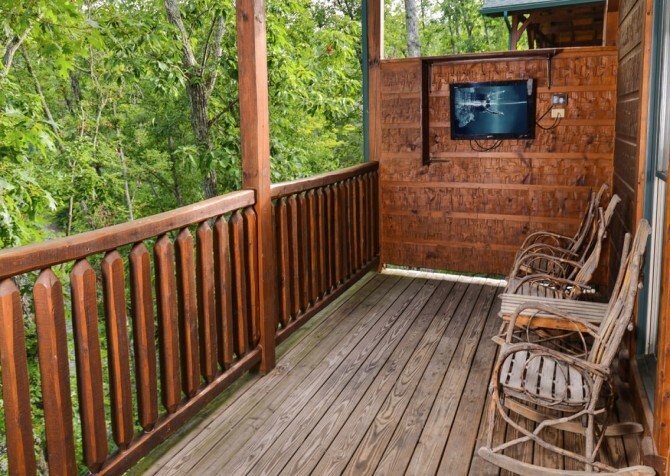 On those cool mountain nights, it's an ideal spot for watching your favorite show without missing out on your beautiful natural surroundings. 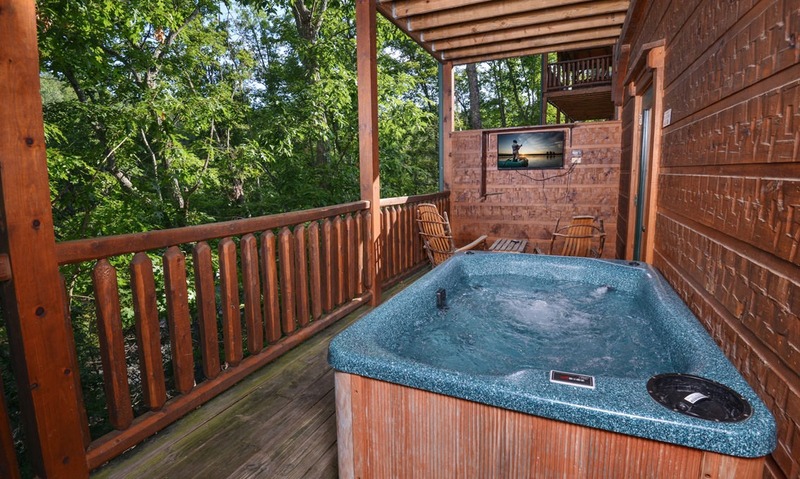 On another deck, find the hot tub, which provides you a great place to unwind after a day of hiking, biking, horseback riding, or exploring the Parkway in downtown Gatlinburg or Pigeon Forge. There is even a TV on the deck by the hot tub – what a way to relax! On the front porch, sit back in the porch swing or sit down for a snack at the bistro-style table. This spot at Mountain Getaway and a Theater will provide you with some of the best mountain views at the cabin. 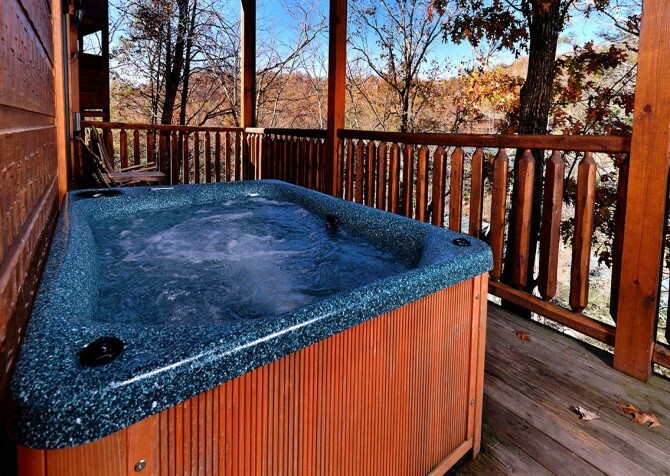 Take a break while taking in the beautiful rolling hills in the distance. 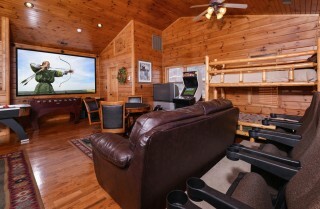 The theater room/rec room in Mountain Getaway and a Theater will probably come to be your favorite space in the cabin. 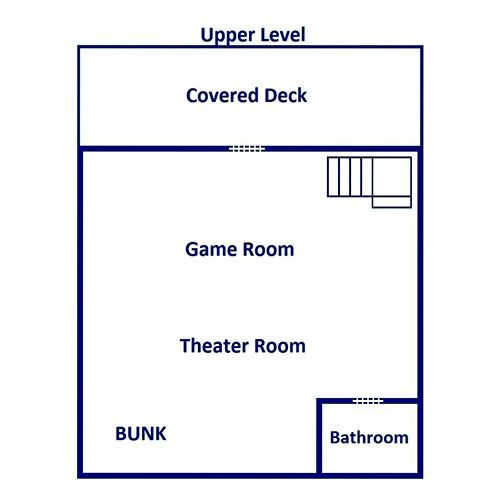 Loaded with games, a huge movie screen, and lots of seating, it's a great group space that both kids and adults will appreciate. Bring along your favorite movies to watch on the huge movie screen as you curl up on the comfy leather sofa or sit in the theater-style chairs. You can play cards or board games at the poker table with seating for four, or you can get nostalgic while playing games on the 2 arcade consoles. There is an additional big screen TV for those wanting to watch a ball game or their favorite shows. 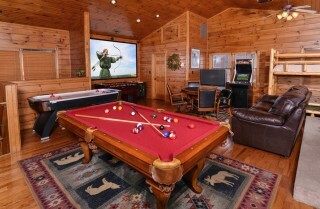 The room also boasts a pool table, air hockey table, and foosball table! You will never get bored, no matter how many hours you spend here! This room also houses a bunk bed, making it the ideal place for kids. They will absolutely love having their own room that's loaded with games and their own private theater! 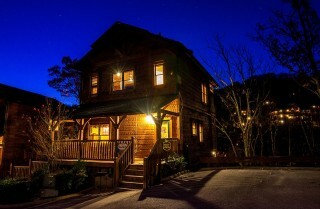 Mountain Getaway and a Theater is loaded with everything you could need for a memorable stay in the mountains. 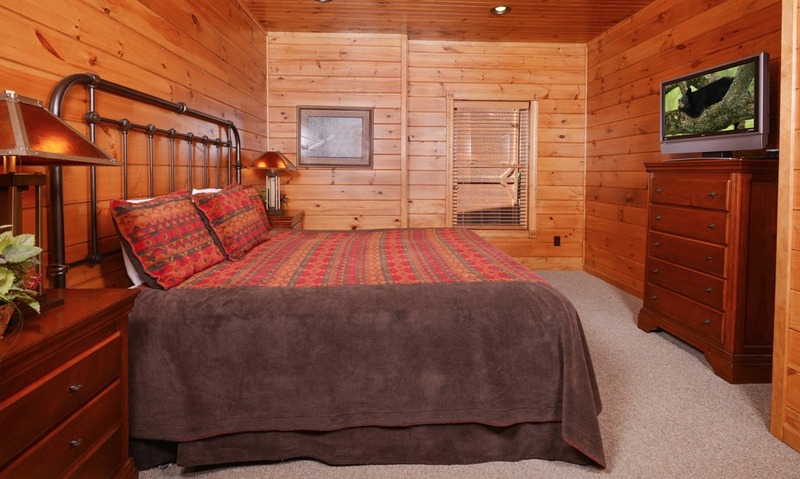 If you need additional sleeping space, you'll find two queen sleeper sofas. The cabin is also pet friendly, so you can bring even the 4-legged members of your family along with you. 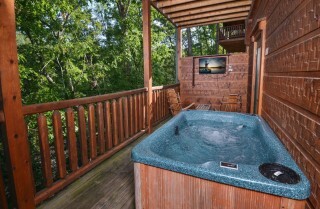 Other conveniences you'll find include a charcoal grill, washer and dryer, high-speed Wi-Fi, and a DVD player. Located in the Gatlinburg Falls Hidden Valley Resort, the cabin offers access to community amenities, including pools, an exercise room, a wedding chapel, and meeting spaces. 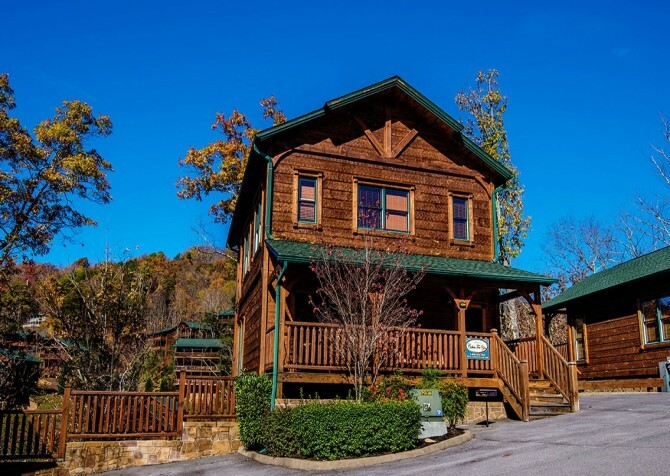 Expect a heaping plate of flavorful Mexican cuisine at this restaurant in the heart of Gatlinburg. 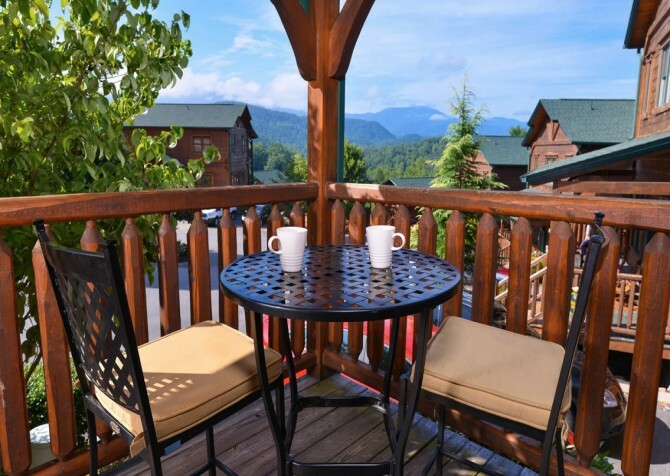 Just down the road from Ripley's Aquarium of the Smokies, it's conveniently located to the attractions of the area. Don't miss out on the most visited national park in the U.S. during your stay in the Smokies. You can hike, bike, go horseback riding, picnic, swim, or take a scenic drive in this beautiful national park! 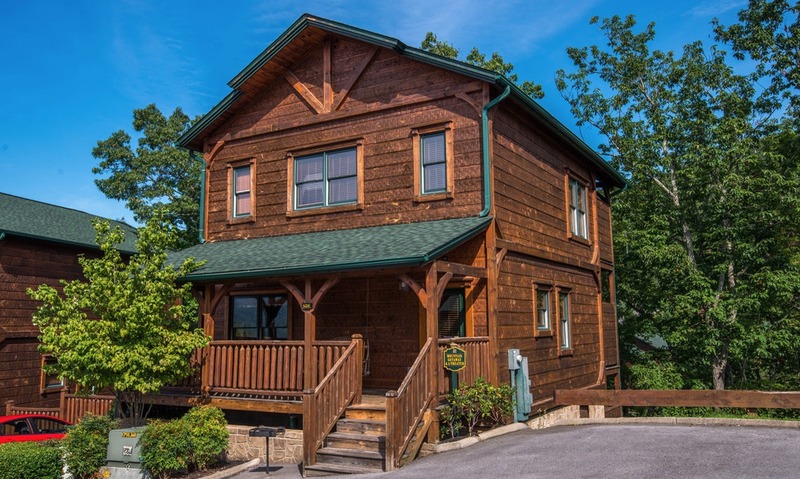 Enjoy a hearty meal and some exciting entertainment at Dolly Parton's dinner show in Pigeon Forge. 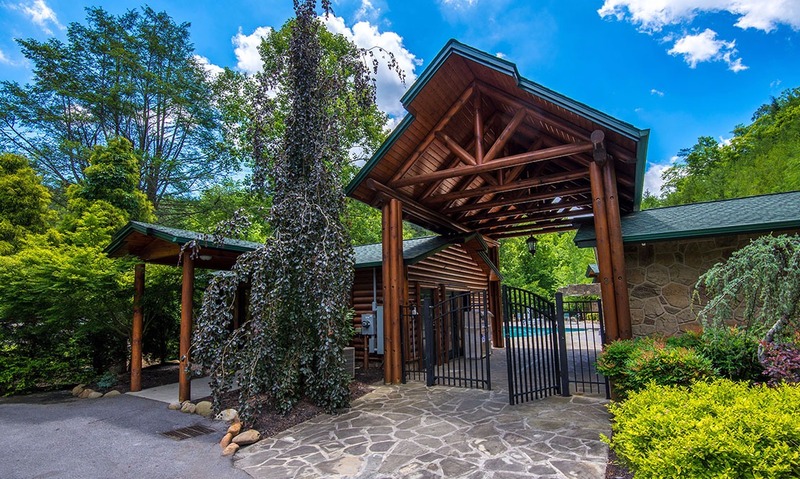 It features horse stunts, country music, Southern food, lighting effects, dazzling costumes, and a fun atmosphere for the family. "We brought our family here for a long weekend...The cabin was very suitable for the ten of us. 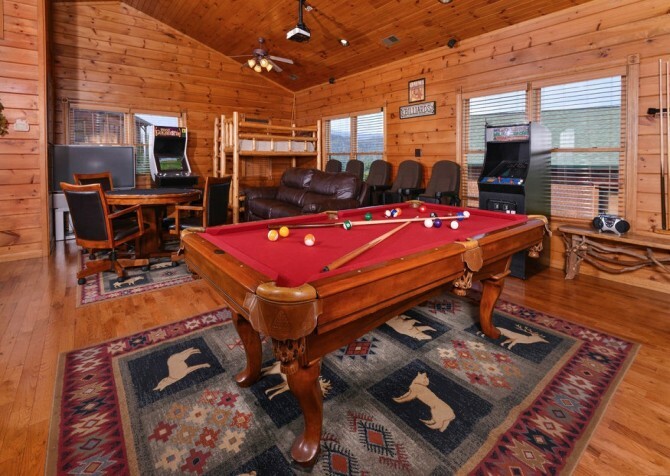 The grandchildren really loved the hot tub and the game room upstairs. The pool table was used everyday for a pool tournament. The cabin is located off…"
"We brought our family here for a long weekend...The cabin was very suitable for the ten of us. 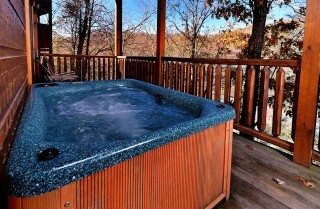 The grandchildren really loved the hot tub and the game room upstairs. The pool table was used everyday for a pool tournament. 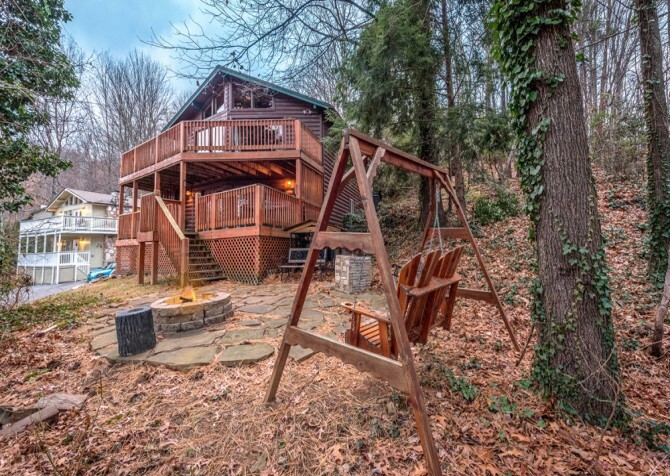 The cabin is located off Gatlinburg Way which isn't to far from downtown Gatlinburg and highway 321. We thoroughly enjoyed our trip and look forward to our next visit. There was an issue with the door opening but Don the maintenance man came out and fixed the problem...Don also came back the next day to check and make sure the door was opening properly and to pick up his drill he left. 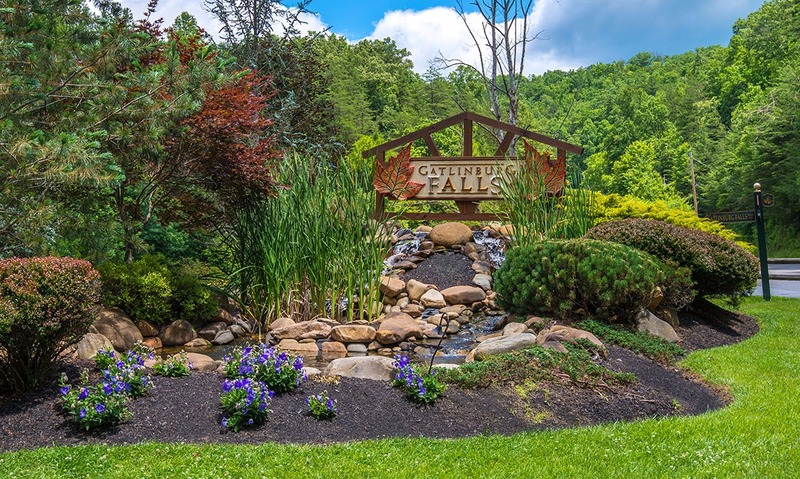 He had a maintenance call and then came back and went out of his way to take our garbage to the dumpster for us.....Overall we had a great time and a great experience." Thank you so much for this wonderful review! We are so glad to hear your family enjoyed your stay. 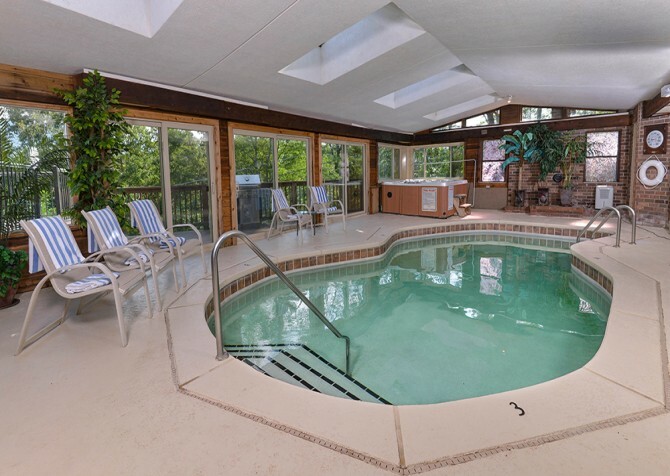 From the hot tub to the pool tournaments it sounds like you had a great time! We look forward to having you stay with us again in the future. 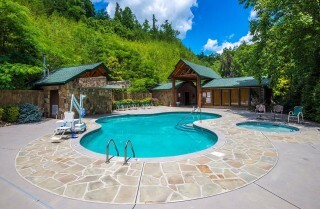 "The stay was great and I wasn’t ready to go back home it really felt like home." Thank you so much for the review! 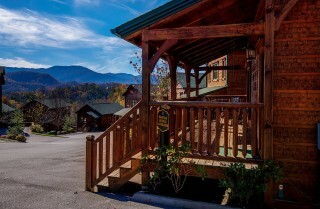 We are so glad to hear it felt like home for you!